I'm rather picky about historical accuracy. Let's just say that I've not always known as much about research or the way things really were (and my early titles show it). 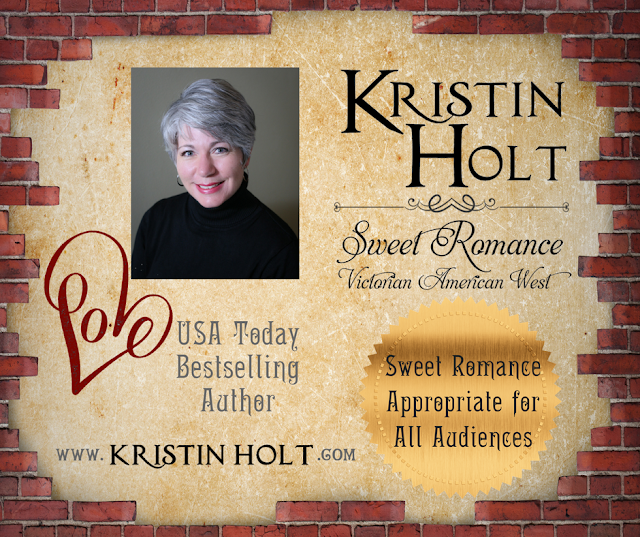 With every book I write, I fall more and more in love with the accuracy, and tiny elements that create a beautiful setting for a romance novel. 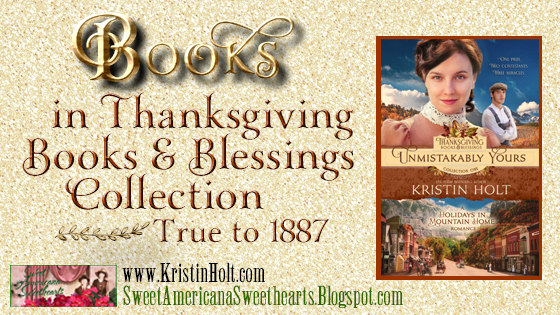 Today, I want to share the "Books" part of the "Thanksgiving Books & Blessings Collection One" Series. Oh, and stick around! Make sure you stick with me 'til the end, so you can enter my PRIZE DRAWING for an ebook, standard paperback, or LARGE PRINT paperback of this NEW RELEASE. We all know "the sky is falling" and "Chicken Little"... but just how old is old? Hmmmm.... I was thrilled to find Mrs. M.E. Hall, widow of the late Salmon Hall advertising the sale of all kinds of books (even if she misspelled stationery as stationary) at her residence one door east of the Book Store formerly occupied by her late husband... as she's selling all of his remaining wares... In New Bern, North Carolina. In 1842. Chicken Little is for sale, along with many other still-familiar titles, in the Newbern Spectator of New Bern, North Carolina, on February 19, 1842. Yay! Proof that "Chicken Little" was plenty familiar by my story, set in 1887. But what are the chances that this "Chicken Little" is actually of The Sky is Falling vintage? Another historical newspaper clipping, published in The Times-Picayune of New Orleans, Louisiana on April 15, 1843, verifies the connection. See the transcription, below (I've taken care to maintain everything from paragraph breaks to punctuation-- quite different from today's). The original image is dark and difficult to read. THE SKY FALLING.---The following humorous little nursery story, told by N. P. Willis, has a very ingenious and excellent point to it, showing, as a moral, how timid persons may be thrown into terror, and how there is always a "Fox Lox" ready to take advantage of their fright. Silly superstition and love of the marvellous [sic] will furnish capital to support humbug and imposture, until the end of time. Let the "Chicken Little" followers of Parson Miller look out for their "Fox Lox." "Did you ever hear of Chicken Little, how she disturbed a whole neighborhood by her foolish alarm? Well, Chicken Little was running about in a gentleman's garden, and she ran under a rose bush, and a leaf fell on her tail; and she was dreadfully frightened, and ran away to Hen Pen. 'Oh, Hen Pen,' said she, the sky is falling!' 'Why, Chicken Little, how do you know it?' 'Oh, I heard it with my ears, I saw it with my eyes, and part of it fell on my tail.' 'Come, then,' says Hen Pen, 'let us run as fast as we can!' So they ran till they came to Duck Luck. 'Oh, Duck Luck!' says Hen Pen, 'the sky is falling!' 'Why, how do you know it?' says Duck Luck. 'Chicken Little told me.' 'Chicken Little, how do you know it?' 'I heard it with my ears, I saw it with my eyes, and part of it fell on my tail.' 'Oh, let us run,' said Duck Luck; and they went on until they came to Goose Loose.-- 'Oh, Goose Loose!' says Duck Luck-- 'the sky is falling!' 'Why, Duck Luck, how do you know it?' 'Hen Pen told me.' 'Hen Pen, how do you know it?' 'Chicken Little told me.' 'Chicken Little, how do you know it?' 'I heard it with my ears, I saw it with my eyes, and part of it fell on my tail.' 'Run! run as fast as you can,' says Goose Loose.---And away they all went until they met with Fox Lox. 'Oh! Fox Lox, the sky is falling!' 'Who told you?' says Fox Lox. 'Goose Loose told me.' 'Goose Loose, who told you?' --'Duck Luck.' 'Duck Luck, who told you?' --'Hen Pen.' 'Hen Pen, who told you?' 'Chicken Little.' 'Chicken Little, who told you?' 'I heard it with my ears, I saw it with my eyes, and part of it fell on my tail!' 'Make haste,' says Fox Lox, 'and all come into my den.' Fox Lox opened the door, and in they went, and he made a supper of them;---and all this from the foolish fright of Chicken Little." This example is common of the Victorian Era in the United States-- Newspaper stories retelling folk tales or fairy tales (all of which were not happy endings), intended to teach the morals of the day: honesty, obedience, integrity, wisdom, etc. The Chicago Tribune, July 31, 1886. Note, above, "His (Mr. Robert Louis Stevenson's) "Strange Case of Dr. Jeckyll and Mr. Hyde" was published twenty-two weeks ago, and 22,000 copies have been sold--a thousand a week." The following newspaper clip was published in The Clay Center Dispatch of Clay Center, Kansas on June 17, 1886, illustrating the likelihood that this title would be quite available (and of interest) in Mountain Home, Colorado, that very autumn. The Clay Center Dispatch of Clay Center, Kansas on June 17, 1886. Yipee! This well-known title was published in 1876, and though originally a commercial failure (according to wikipedia), newspapers of the decade show the title was certainly available for sale and people did buy it. "Adventures of Tom Sawyer" won as a prize in a spelling match. McPherson Freeman newspaper of McPherson, Kansas on August 13, 1886. I'm pleased to offer to one winner his/her choice of the kindle edition, standard paperback, or large print edition of the paperback (paperbacks will be awarded to winners residing within the United States only; if the winner lives in another nation, I'll substitute the kindle edition). What books have you seen mentioned? How do books play a role inside a story? If you were an author, and needed books to play a role in a book you're writing, how would you include that element? ONE winner will be drawn at random on Monday, October 8th at 7 PM Mountain Time and the winner's name will be posted here. Set an alarm in your cell phone so you'll remember to check back! To be quite honest, I never thought about the use of era correct books in a story. I've read several where the main character writes in her journal, but I don't recall any book titles being used. Another of the many, many reasons I'm a reader, not an author! ;) This is my favorite era for book settings. Thank you. Thank you, Robin, for your genuine reply. You're entered in the drawing for a copy of this new release. Thanks! So interesting. I have some old books such as Huck Finn and I believe Tom Sawyer now I have to check. My Dad gave them to me. I think they were published early 1900s. Please do check! If you find an earth 20th century, chances are it's a later edition. I know one thing for certain-- I'm far from perfect and quite fallible. (chuckles) I know many of those well-known, best-loved Victorian titles are available in brand-spanking new paperbacks at BN (brick and mortar), in the "classics" section. Please let me / us know what you find out! I haven’t ever thought about it but if I was an author writing a story I would tell the story that another author was writing. I have actually read two stories this way. One was Robin Carroll. Her character was writing a book and she had to get away to a remote cabin to finish her book. It was a story within a story because I was reading Robins book and reading the character’s story too. However, I’ve listened to a book recently that was quite fascinating because it was a story within a story! Hannah - main character - is writing her own masterpiece. It was “All Things Beautiful” by Keely Brooke Keith. This was my first experience and I enjoyed it! Blessings, Natalya! We've found another "story within a story"-- which is fascinating to me. Thanks for the book recommendation. I'll check out "All Things Beautiful". Thanks for entering the book drawing, and for contributing to the conversation. I read this book too. I had forgotten it was a story within a story also. Little Women was a favorite of mine from my teen years. My dad had a copy of it in his library and I remember reading it many times. There were 9 kids in our family, so the sisters of Little Women felt like it was part of my life. What a wonderful historical novel! I love Little Women, too. Thanks for entering the drawing, June. I read The adventures of Tom Sawyer as a kid and read this book with my children. I loved it when I was young and my children love it too. I can't wait to read it to my grandchildren someday. Thank you so much for the chance to win one of your books. Thank you, Tammy, for contributing to the conversation, and for entering my drawing! I think books in a story can tell the reader a lot about the main characters & their interests. So, keeping it real with books that are of the correct time period is important. Your research is impressive. Stories mentioned were "Kidnapped", "Jekyll and Hyde" and also "Adventures of Tom Sawyer". Comparisons between a familiar book mentioned in a story helps you relate more to the situation at hand within the current story. I agree. Comparisons between familiar books do help readers relate. Far better than a not-known title. Thanks so much for contributing to the conversation and entering the drawing. Kristen, Thank you for your extensive research! I don't get hung up on historical inaccuracies. I enjoy the story. I love it when characters are reading books. I think I might be a bit overboard with research. Thanks for allowing me my idiosyncrasies. 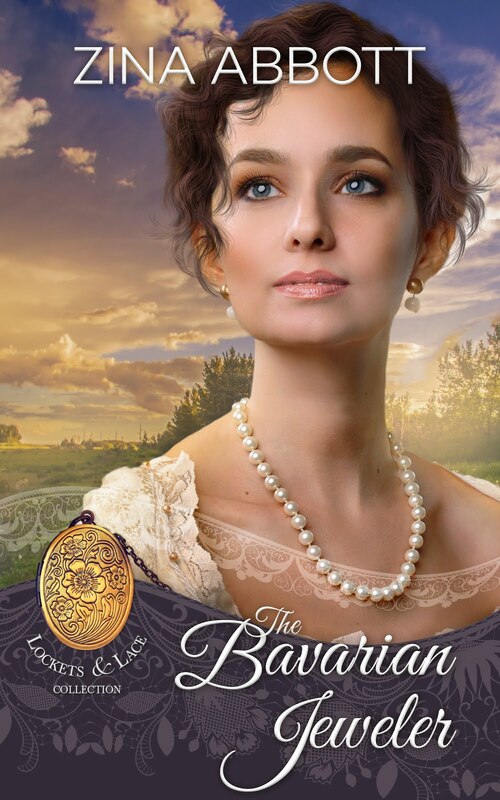 =) I'm delighted to learn most readers simply LOVE the western historical romance genre for the types of stories that it naturally has... and genuinely don't mind if things are "inaccurate", after all, it's fiction(!). I'm glad you're one who enjoys the story, especially reading characters. Yay! I'm particularly soft in the heart for heroes who read. I'm pleased to announce that all names were put into the Stetson, and the WINNER is "Robin in NC". Congratulations! Robin, you may select your choice of editions of Unmistakably Yours: kindle, paperback, or large print paperback. Please contact me either by email (Kristin AT KristinHolt DOT com)[Kristin is e-free] OR through my website: www.KristinHolt.com/contact (just copy and paste into your browser window). I look forward to hearing from you!